Medical Alert System! Talk Directly through your pendant to a 911 emergency operator at the push of a button. 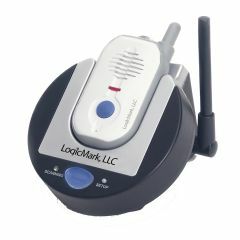 The Guardian Alert 911 medical alert system is a set - a base station which plugs into the phone jack - and a pendant which is worn by the user. The Pendant runs a year on a AAA alkaline battery (included). The pendant is splash resistant so that he can even be taken into the shower. The Test Button on the bottom of the unit gives an audible confirmation of battery condition. Hold the Test Button in an extra few seconds - and you can confirm that the full system is working. Yes, the Guardian Alert 911 uses a AAA alkaline battery, which is included. The battery life is one-year and it can be tested at any time with the test button on the unit. You can also purchase the Battery Back Up Pack for the Alert for added peace of mind. As the oldest baby boomers become senior citizens in 2011, the percentage of people 65 and older is projected to grow faster than any other age group. In fact, 26 states are projected to double their 65+ and-older populations between 2000 and 2030. There is a only a 6% to 9% early mortality rate from Heart attack for those who survive long enough to reach the hospital. Getting to the hospital quickly is the goal. Deaths from cardiovascular diseases in women exceed the total number of deaths caused by the next 16 causes. I have no real safety or health issues but i live alone and feel safer taking this with me when i shower or bathe. Also works outside when i mow the lawn. It went through a whole washing cycle by mistake and still works fine. Caregiver. For my mother in law. This system is a little high priced. However at comparable systems being $40 a month monitoring This product is a value without compromising the security. I no longer have to worry I know she can obtain help in case of an emergency and she is alone. This is exactly what I was looking for to use with my elderly Grandmother. She wears it around her neck in case of a fall or other emergency. The screws that hold the back on for the battery compartment are extremely small!! I can't imagine too many elderly people who will be able to change the battery without help. Not only are the screws tiny, they are not magnetic and hard to hold onto with the screw driver. There must be a better way. by Pearl's mom from Midland, Mi. I TRIED IT OUT ON TRIAL BASIS AND IT WORKED PERFECTLY.SOMEONE FROM 911 CAME ON RIGHT AWAY. Doesn't it have a battery back up? If so why would you need to buy another one? Is a lock box available? Can I reprogram with my cell number instead of 911? Another company that I was looking at said that their product would not work with digital phone (Time Warner Cable). Could you let me know if this matters with your product? Also, how many person's numbers can be stored in your system?